True to form, Germany’s finance minister Wolfgang Schäuble got his retaliation in first with talk about blackmail demands from Athens. Big boys’ rules from Berlin. The eurozone crisis over Greece threatens to turn into more than a war of words. The prospects do not look good for dealing with this existential threat to the eurozone, and even to the European Union itself. Thank goodness, then, for the call for calm from French Socialist EU Economics commissioner Pierre Moscovici. If only his declaration that: “Our common goal is to enhance growth” were true. Sadly growth has taken second place to austerity ever since EU leaders prioritised cutting budget deficits above all else at the G20 Toronto summit in June 2010. That policy has hit the eurozone economies badly ever since. It is still doing so today. The International Monetary Fund expects the eurozone to grow this year at only one third the pace of the United States economy. Greece has been hit hardest of all. Aneurin Bevan noted generations ago that shock therapy can prove fatal. The Greek economy has been in a state of shock for years at the hands of the “troika” of the European Commission, the European Central Bank and the International Monetary Fund. It hasn’t worked. Now the Greek people insist, rightly, that there has to be a better way, preferably within the eurozone with the help of their partners. German leaders can justly point out how well their country adapted to reunification and the single European market in the 1990s, and to the euro and EU expansion in the first decade of the 21st century. But Germany didn’t have to adjust in the face of the greatest global financial crisis for 80 years. The Greek people have had to endure unemployment rates of 25 per cent overall and 50 per cent among young people, a 40 per cent cut in spending since 2008, and no hope of any let-up for the foreseeable future. On top of all that misery, Greek debt has gone up, not down as the austerity was supposed to deliver. Another catastrophic failure for neoliberal economics so in vogue globally. Nobel Prizewinning economist Paul Krugman has pointed out that Greek government spending has been far lower than that envisaged in the stand-by arrangement agreed with the troika in May 2010, which assumed a short, shallow recession would be followed by recovery. Instead of growing, Greek gross domestic product collapsed, forcing upward the Greek debt to national income ratio and giving a false impression of Greek reluctance to meet commitments to its international partners. Yes, Greece has been helped by its EU and IMF partners in the form of big loans on favourable terms, plus pressure on Greece’s private sector creditors to write off some of what she owes. But the underlying reality is that this has been another backdoor bailout of the banks. Greek debt previously owed to private sector banks is now owed to other eurozone governments and the IMF. The Greek people have felt no direct benefit – indeed, the very reverse. Nor have they received much thanks for cutting Greek wages relative to rivals by 15 per cent since 2010, restoring much of the country’s competitiveness and bringing Greece’s balance of payments into surplus. Just as the Greeks German critics demand. In September 2008, the American government badly underestimated the likely implications for the world economy of allowing Lehman Brothers to go bankrupt. Its frantic efforts to undo the damage only hours later by rescuing AIG could not turn the clock back. Irretrievable damage had been done. The consequences were not confined to Lehman and its trading partners. World trade began to sink as fast as it did at the start of the 1930s’ Great Depression, as credit dried up and firms and families cut back their spending. The law of unintended consequences could come into play again here if Greece’s EU partners refuse to recognise that the Greek people have reached the end of the austerity road. They cannot carry on with bailout terms that mean transferring some 20 per cent of Greek national income to their creditors by running huge budget surpluses between now and 2020. Such a budget squeeze would deny any chance of real recovery and condemn our Greek friends to unremitting misery. The way forward is for Greece’s EU partners to switch priorities from failed austerity and debt to growth. They could do so by backing the call made by Nobel economists Joseph Stiglitz and Chris Pissarides for Greece not to have to service any debt for the next five years unless the Greek economy is growing at 3 per cent or more, and until Greek GDP has recovered half the ground lost since 2008. This should be allied to some debt relief and a major easing of the requirement for Greece to run huge budget surpluses. But Greece should still meet her commitments to tackle tax evasion and corruption. That will take real understanding in Berlin and Brussels that the future of the EU and not just of Greece is at stake. Political posturing for the benefits of the volk back home is out of order. Mr Peter Hain (Neath) (Lab): Why is losing in Brussels always such a magnificent victory to the Prime Minister and his Back Benchers? The Prime Minister: I always prefer it when we succeed in, for instance, cutting the EU budget or reinforcing the need for deregulation, but what matters—and the right hon. Gentleman, as a former Europe Minister, should know this—is that there are times when it is important to stand up for a principle and not to give in, no matter what the pressure may be. It does not matter how many countries were ranged against me. I think that Jean-Claude Juncker was the wrong candidate, I think that it was the wrong principle, and there are times when you should stick to your guns. 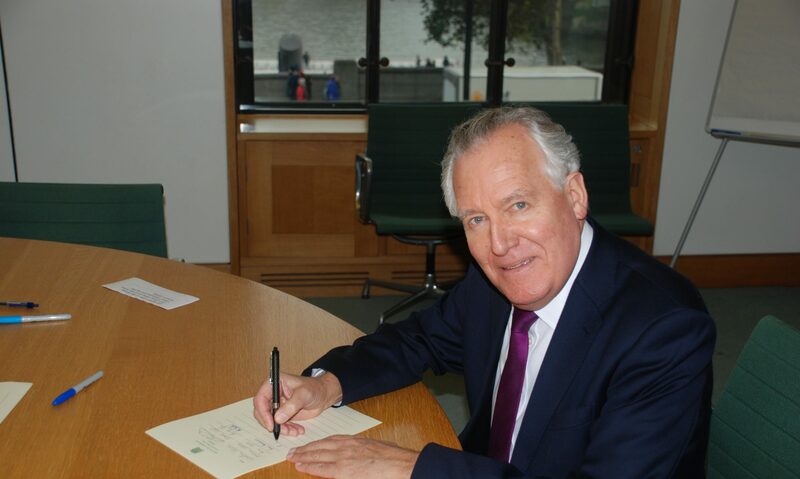 Mr Peter Hain (Neath) (Lab): I endorse the strong criticism across the House of the serious breach of an international treaty in opening the bag, but may I probe the Minister’s diplomatic strategy to resolve the escalating tension of the past few months? Will he revisit the work done by Lord Howe and Lord Garel-Jones under his party’s leadership in government, and by my right hon. Friend the Member for Blackburn (Mr Straw) and I under the previous Labour Government, which respects the paramount rights of Gibraltarians but recognises that Spain, currently one of our closest friends, has an historic grievance? Until we bring people together for proper negotiations, we will not resolve these matters. Mr Lidington: I would like to see people come together through the ad hoc talks on practical issues, which were proposed in 2012 by my right hon. Friend the Foreign Secretary. We still hope that it will be possible for such talks to take place. I am grateful to the right hon. Gentleman for his support, but may I add, as gently as I can, that I do not believe that the example he and the former Foreign Secretary set when they were in government would help? It added hugely to the sense of mistrust in Gibraltar about the intentions of the British Government.